This was supposed to be two cards for the Papertrey Ink Bloghop Challenge. What I forgot though is that this is a one day challenge with that day being yesterday! Oh well, it is now just a Sandra and I Challenge. It is fairly obvious that I was inspired by the colour scheme and the bottle brush trees. I have to tell you that originally I had the penguin placed between the bear and the fox, but Sandra told me that it looked like the fox was farting on the penguin. Well of course, I had to change things up a bit. 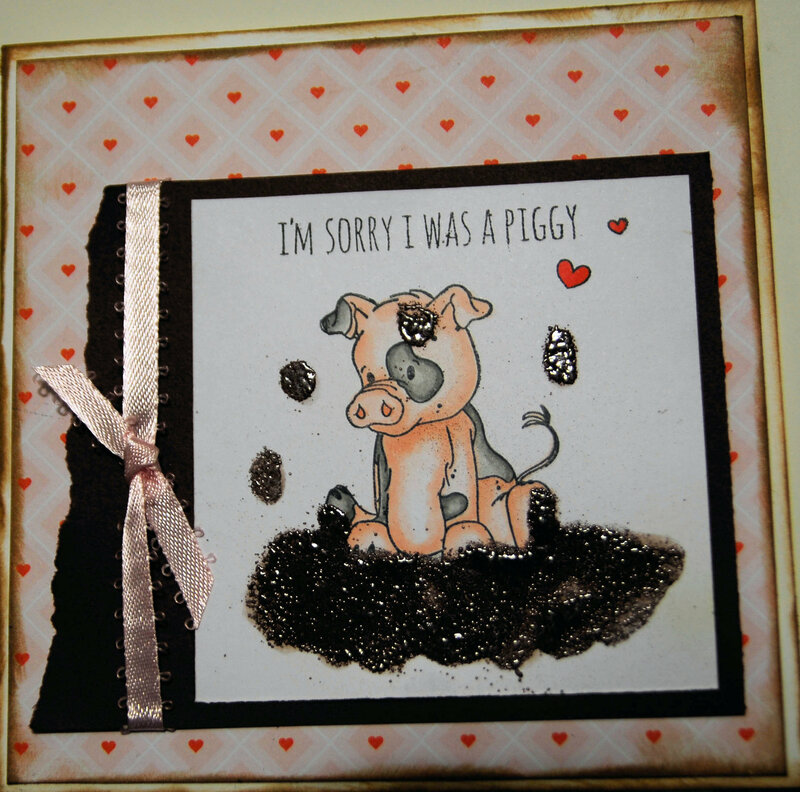 Now here is Sandra’s card using the same inspiration photo. You will note that no one is farting on anyone else, BUT there is a giant icicle about to fall down and kill the bear! Just saying! Supplies: Papertrey Ink Joyful Christmas and Warmest Wishes stamp set, Impression Obsession icicle. Sandra’s card is coloured with Copic Markers while mine is coloured with my super sized set of Prismacolor pencils that I got for Christmas and Gamsol. Simon Says Stamp has a special challenge on to share cards using their new character, named Dexter. 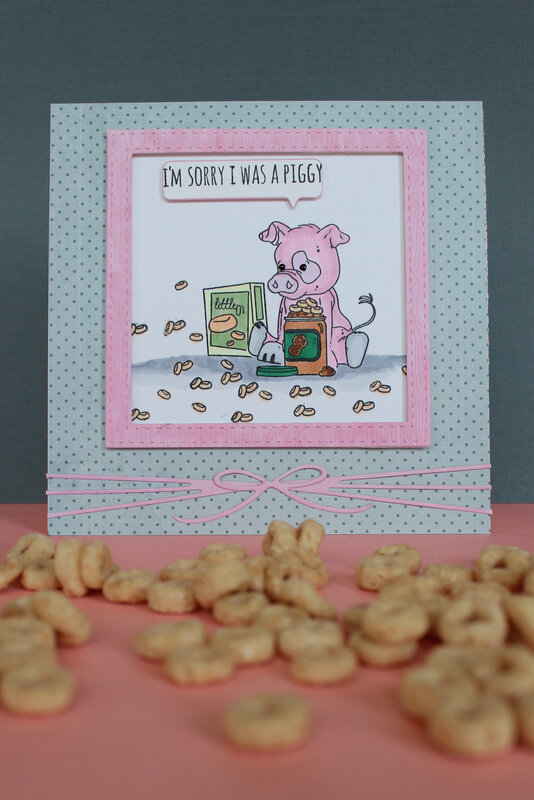 Dexter is a pig and hangs out with his friend Simon who is the namesake of Simon Says Stamp and a dog. Just suspend your disbelief and go with it. In fact, after all the weird animal friendship videos that have been popping up on my Facebook, it really isn’t that hard to imagine a great friendship between a dog and a pig. I have definitely seen stranger on You Tube, like a lion and a monkey (albeit after the lion ate the monkey’s mother for lunch……but I digress). The great thing about this challenge is that Sandra and I both have the introductory stamp set called Dexter and Simon. We decided to make it a challenge within a challenge and thus the title of this post………..Dueling Cards. I have to post this in two posts so that I can link both the cards to the SSS challenge, so make sure to have a peek at both posts. Supplies: Simon Says Stamp Dexter and Simon, SEI patterned paper, Stampin Up and Neenah card stock, Stampendous embossing powder, Versamark, Memento and Tim Holtz Distress inks, Copic markers, and unknown ribbon. This is the second post for today. Sandra and I are entering a challenge over at Simon Says Stamp that requests that we use the new stamp character Dexter on a card or project. Because Sandra and I both own the introductory stamp set, Dexter and Simon, we decided to have a challenge within a challenge and each make a card for the Simon challenge. Are you still with me? Here is my entry. You can tell it is my entry because of the pink. Sandra doesn’t like pink. Now I am thinking that with a name like Dexter, he is a male pig. It is not toooooo much of a stretch though, to be thinking that…………REAL PIGS WEAR PINK!………………………..so here it is. Supplies: Simon Says Stamp Dexter and Simon stamp set, Pretty Pink Posh Ribbon and Bows die, Simon Says Stamp Woodgrain card stock, Simon says Stamp Talk Bubbles 2 die, Echo Park Winter Wishes patterned paper, 3M foam tape, Wink of Stella clear glitter brush, Copic markers, X-Press It card stock and Scor tape.